Some risks are out of our control but others can be managed. Knowing the risks of driving can help to reduce your risk of crash. Alternate transport can reduce crash risk. Buses and trains have a crash risk 5 times lower (0.20 fatality risk relative to car). However, cars are preferred as they are faster and more convenient. First 6 months of red Ps is the most dangerous period. You survived this - well done! Statistically, male drivers are at greater risk than female drivers. A lot of young people are more worried about permanent disability/disfigurement than death. For all casualty crashes (those that involve injury), 1 in 50 is a fatality. You determine a lot of your own risk as some driving risk results from who you are, what you think and how you look at the world. Risky behaviour increases crash risk. External sources also contribute to overall risk. Most people have an amount of confidence in their abilities. Confidence can work against you as a driver. The most confident drivers are often the least experienced, meaning they are likely overconfident and overestimate their ability. In the first five years of driving, overconfidence can be a factor in many crashes as negative outcomes are underestimated. Overconfidence is boosted when you speed and don’t get caught as you feel you are a better driver than other people. You think it won’t happen to you as only 1 in 140 licence holders are involved in a casualty crash each year. However, the risk of being caught for traffic violations is 1000 times greater than being killed in a crash. So you are likely to get booked, pay heavy fines, incur demerit points or lose your licence if you drive unsafely. How good a driver do you think you are? Male drivers tend to rate themselves as better than other drivers of the same age and experience. 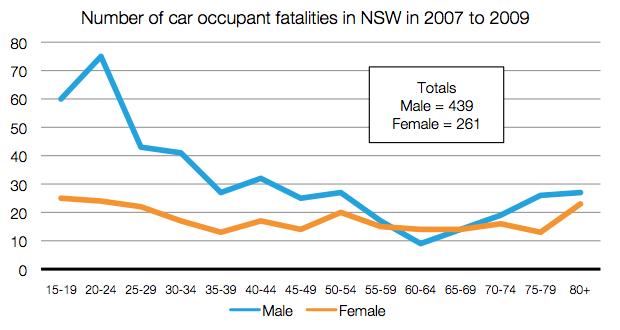 This feeds into overconfidence and sees men less than 25 years old over-represented in crash statistics. Female drivers are more likely to consider their skill equal to or less than others. This contributes to reduced overconfidence and reduced crash involvement. People don’t like to admit they were wrong or made mistakes including when involved in crashes and making insurance claims. Drivers tend to attribute externally, blaming the other driver, the road, or the weather for a crash but take little responsibility themselves. A far healthier situation is being able to honestly assess the contributors and realise what’s your fault and what’s not. This will make you a safer driver. Most crashes are due to human error alone. If you add all the sections with human involvement together, it’s more than 90% of crashes. Acknowledging that you can and will make mistakes allows you to minimise your risk as a driver, protecting yourself and others. Motivation affects how you drive. You are more likely to speed and take risks when you are running late (and try to justify this behaviour if caught) but you wouldn’t if time wasn’t an issue. Young male drivers are more likely than women to let emotion affect their driving and are more likely to drive erratically or aggressively while letting off steam. Some people drive quickly and riskily for excitement or to relieve boredom. These people are more likely to get caught or crash and it’s ridiculous that such motivation threatens the safety of themselves and others. Although safety is not the primary motivation for driving (it’s more likely convenient transport), it’s important to understand motivations and minimise risks based on them. Some risks can be avoided while others only minimised. Some people have enough risk in their lives while others seek it out for excitement. To gauge your risk taking behaviour the RMS have a 19-question, true or false ‘Sensation Seeking Scale’ quiz. The higher the score the more risk you’re willing to take on. Men under 26 will likely score higher than older men and women. Regardless of your Sensation Seeking Scale score, you can use this self-awareness to assess your behaviour and potentially channel a need for thrills into other activities. Everyday driving is risky enough without the need to add to it. Common risky driving behaviours include speeding, tailgating (following cars too closely) and running red lights. These behaviours are illegal and greatly increase the chances of a crash. Everyone shares the road so risk taking is unacceptable as you endanger people’s lives who don’t know or accept that you’re increasing their chance of injury or death – get your excitement elsewhere in a controlled environment. ‘Road rage’ is retaliation by one driver for what they see as another driver wronging them in some way (e.g. cutting them off). It is unacceptable behaviour as assault and threatening behaviour are offences in NSW and the other driver’s alleged wrongdoing is not a defence. If you encounter road rage it should be reported to police. Alcohol contributes to 20% of fatal crashes and 5% of crashes causing injury. More than half of the drivers killed have a blood alcohol concentration (BAC) of 0.15 or more (that’s 3 times the legal limit of 0.05!). On your learners, red Ps and green Ps you have a limit of zero. This increases to 0.05 on your full licence. What it takes to stay under 0.05 is different for everyone and depends on how much you drink, the time it takes to drink, as well as your gender, weight, general health, liver function, and how quickly your body breaks down alcohol. Compared to their heavier counterparts, people who weigh less get high BACs faster as they have less blood to dilute the alcohol and have less capacity to break it down. As it is difficult to know if you’re under the limit, the best advice for all drivers is don’t drive if you’ve consumed alcohol. At 0.05 BAC the risk of crashing is double what it is at 0.00 BAC. Alcohol reduces concentration, inhibits your ability to identify and respond to hazards, slows your reflexes, makes you more likely to speed and disobey traffic signs (if you notice them at all), and increases the risk of running off the road, particularly when dark and on curved roads. Younger males are more likely to drink and drive and be involved in an alcohol-related crash. A lot of women also drink and drive, particularly those aged 40 and over. Most alcohol-related crashes occur in ‘high alcohol hours’ – weeknights (particularly Thursday and Friday) and weekends (with the rest of the time called ‘low alcohol hours’). High alcohol hours are more risky for all road users as drivers are more likely to be affected by alcohol. Alcohol affected drivers are more likely to die if seriously injured as alcohol affects your body’s ability to cope and there are issues when blood is lost making medical treatment harder. This makes a 0.00 BAC the safest option. Breath testing machines in pubs and clubs only give a general indication, if in doubt – don’t drive. Instead, use a designated driver or alternatives like taxies, buses and trains. At 0.05 BAC the risk of crashing is twice what it is at 0.00 BAC. Legal drugs should have warning labels if they affect your driving but if in doubt ask a doctor or pharmacist. If you need to drive, you should not stop taking a medication with side effects but you can ask a doctor or pharmacist about potential alternatives that won’t impact on safe driving. Drugs can interact with each other in a way that may affect driving so check labels and ask if unsure. Illegal drugs don’t have labels so you won’t know about the dangerous side effects or potential interaction until they’re happening. If police think you’re drug affected you can be arrested to provide urine and blood samples that will be tested. If you refuse to give samples you face the same penalties as high rage drink drivers including fines, loss of licence and imprisonment. Fatigue is the experience of being sleepy, tired or exhausted and contributes to 18% of fatal crashes. Fatigue comes from driving long distances, working long hours, partying hard and not getting enough sleep generally. Fatigue crashes are 75% on country/rural roads and 25% urban/metropolitan. High-risk times for fatigue crashes are 4am - 8am and 12 noon - 2pm (particularly on weekends) which lines up with when the body is naturally sleepy. Driving sleep deprived at night and during these times can be fatal. Fatigue crash risk increases with fatigue (or hours of being awake). Fatigue crashes involve male drivers 76% of the time as men drive more than women, are more likely to be employed in an occupation that requires driving, and are more likely to drive when couples or groups travel by road. A certain amount of sleep is required daily (on average 8 hours). If you sleep less than required (e.g. 6 hours) you accumulate a ‘sleep debt’ equal to the hours missed (2 hours). The larger the sleep debt, the larger the tendency to fall asleep. Getting more sleep is the only way to reduce a sleep debt. Distractions from inside or outside the vehicle contribute to 6% of all crashes as they divide your attention and increase the likelihood of errors. Two biggest risks are adjusting the sound system and other passengers. Young drivers (particularly young men) have higher crash risk when travelling with passenger of a similar age as they can distract the driver or may encourage risky behaviour. The opposite occurs if a young male is travelling with their girlfriend or an older female (like their mum). Distractions are most risky during complicated actions like selecting a safe gap in heavy traffic. You should avoid or minimise distractions, particularly during complex situations. Being able to adapt to driving conditions is important as human and environmental factors contribute to 27% of crash causes. Environmental factors alone rarely cause a crash (3%), so most crashes are a lack of adjustment from the driver. These environmental factors include night driving, rain, snow, ice and floods. People more likely to speed at night as visual cues to speed are masked and traffic is lighter. Drivers are more likely to be alcohol-affected at night. Night driving is generally recreational rather than occupational so people are likely to be carrying passengers (increased distraction) and be in new traffic situations. All of these things add to the risk of night driving. You can’t control environmental hazards but you can manage your speed and space cushion to give yourself more time to detect and react to hazards. You can also use low beam headlights during the day to make it easier to be seen, reducing your risk. People rely on expectations to predict road user behaviour when they drive. Drivers with more experience are better at predicting behaviour and therefore cope better when unexpected hazards arise. Road user won’t follow the rules all the time so hazard perception skills are vital to safe driving. Vulnerable road users (little protection during a collision) = pedestrians, cyclists and motorcyclists. Each year 5,500 vulnerable road users are injured or killed. Pedestrians can behave unexpectedly. They are harder to see and may be alcohol-affected. Children are at risk as they do not think like adults. Older people are also particularly vulnerable as although they have experience and sense, they are not as agile or alert. This has led to people over 60 being over-represented in pedestrian crash statistics. When approaching or passing pedestrians slow down and give them space. Cyclists travel on roads, footpaths, and bike paths/lanes (though they often move between them), cycle without lights at night making them harder to see and may ride against traffic and through red lights making them unpredictable. Only children under 12 and supervising adults can ride on footpaths. But kids ride on the road and adults on the footpath, so you need to keep your eyes open, give cyclists space and slow down when necessary. Cyclists are slow at intersections and when making turns. Motorcycles (only 3% of vehicles) are small, can hide behind other vehicles, accelerate quickly and swerve lane-to-lane making them hard to see and unpredictable. They can be hidden in blind spots making head checks vital. Most common collisions are a turning vehicle hitting a motorcycle and a vehicle going straight hitting a turning motorcycle, with the vehicle not giving way in both situations. Motorcyclists are 3 times more likely to be killed than drivers. Trucks and buses are easy to see, slower than other vehicles and need more space to make turns. Though easy to see, it is most often car drivers who cause collisions by cutting them off and hitting them head on while overtaking. Heavy vehicle collisions often involve injury and death as the risk of being killed in a truck collision is 3 times higher than a collision with another car.